A driver of Honda Accord was injured after a California Highway Patrol crashed into it after passing on a red light on Sunday of 04/03/2011. Hayward Car Accident driver and the passenger of the Honda were taken to a Castro Valley Eden Medical Center. 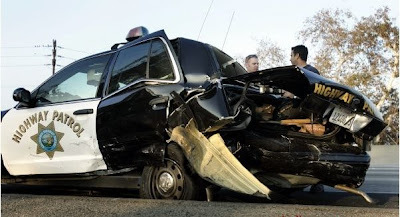 Both sustained soft tissue injuries in this car accident. High speed chase after a motorcycle that was approaching 120 mph on I 880 South bound did not turn out well for a CHP officer and occupants of the Honda. The motorcycle exited at Decoto Road in Hayward and was followed by CHP vehicle passing the Decoto Road and Paseo Padre Pkwy intersection. The second CHP vehicle passed on a red light and collided with Honda Accord which also hit a Lexus that stopped on intersection. Motorcycle escaped from this pursuit and innocent people got injured in this case. One must pay extra attention on big intersection. Many people are in a hurry and often times COPs and Ambulances want to pass on a red light.